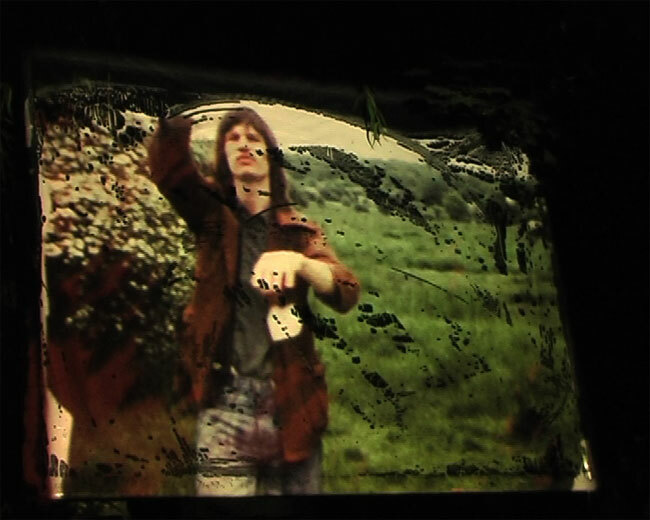 I am a film artist based in London currently working with 16mm film projectors in live performance. These notes describe various performances I have made, often with my partner Lynn Loo, and the events surrounding them. They are written partly as a record for ourselves, but also to share the experience of performing, to give an inside account of an ephemeral art practice that resists documentation and can be hard to convey. At a recent festival of expanded cinema in Seoul, South Korea, I was asked by one of the curators, film artist Hang Jun Lee, if there was an occasion when I’d performed that I considered particularly successful. I answered “yes, Paris in 2006” and offered a few reasons. Accidents often make the best outcomes. 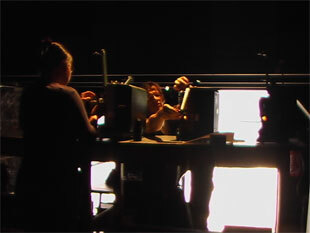 At Rencontres des Labos (2005), a meeting of European artist run film laboratories that took place at Cinenova, an old bank in the centre of Brussels, there were so many films that any attempt to timetable them had been abandoned and projections continued without gaps for days. In the middle of this I accidentally projected the film for my performance Man with Mirror at 24 fps instead of the usual speed of 18 fps. Having to move the mirror/screen so much faster transformed the work, and I found myself on an adrenaline high afterwards. 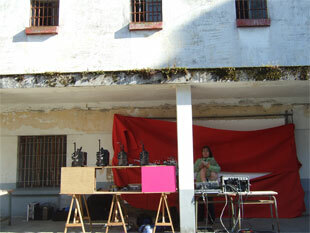 (S8) Festival in A Coruna Spain 2011 was particularly memorable. It took place in an old prison by the sea. The organizer, Angel, told us that the previous year when the festival opened some ex prisoners, along with their relatives, had dropped by to see where they had been incarcerated. 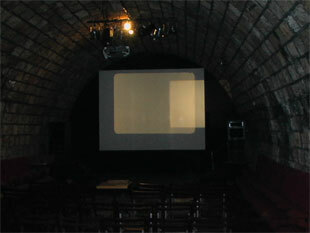 Several of the trashed cells had been converted into little video installation rooms for the festival. The Panopticon, where the guards could keep an eye on all four corridors at once, had imaginatively been transformed into a lounge and soft play area, ideal for our two young children. Lynn and I performed our films after dark in one of the four large exercise yards, projecting directly onto the high prison wall. Seagulls glided above, attracted by the projection light, their mewing mingled with our soundtracks and with the cries of our ten month daughter Mei. My nephew Ben Dowden, also a filmmaker, had flown to Spain to record his uncle in action and you can hear all this in his recording of Man with Mirror: www.youtube.com/watch?v=DX1-xuCNIeg. Ben (aka dowdenboy) runs a popular website with his videos of street musicians. Later he told me that he had uploaded the video and within a couple of days had several thousand hits, and a record number of ‘wtf’s as well. You can hear glasses clinking in this cabaret style setting and someone in the audience proclaiming the virtues of material film. 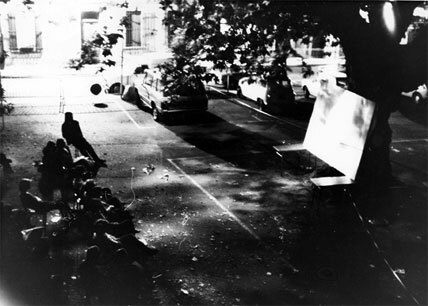 A few years later I performed outdoors at an arts festival in Brighton. Again it was Man with Mirror (it’s disconcerting to have made my most popular performance work so early in my career) and took place on the pebbled beach at night with the sea as a backdrop. This is difficult, because if you step out of line with the projector beam the audience has nothing to see. All these interpretations were fascinating and took the work in unexpected directions. But at AAVE Festival in Helsinki, 2012, something else happened. Unusually, we had no one lined up to perform with us. Earlier that day I had screened Views From Home, a time lapse film that features the movement of light through rooms, and a soundtrack of improvised sax by Alan Wilkinson with whom I had previously shared a flat. After the screening a sax player from Naples, Mario Gabola, approached us, amazed that we knew Alan who he greatly admired. 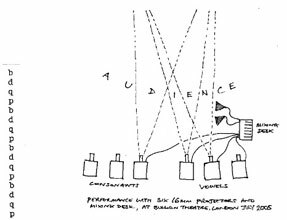 We invited Mario to perform with us that evening on Vowels & Consonants, and he gave a great performance, with guttural throat and breathing sounds that played rhythmically with the sounds of the graphic letterforms – both optical and imagined. 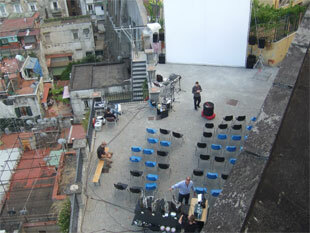 Later, when we came to Naples, we invited him to play with us again and it was he and Sec, a.k.a. Aspec(t), who continued playing through the rainstorm mentioned above. 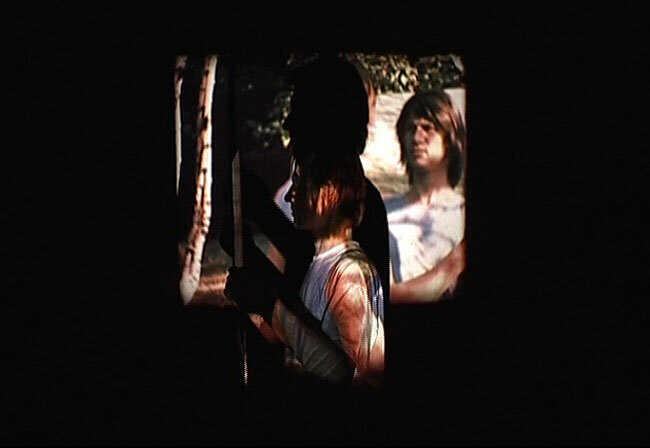 A recurring theme in my work has been re-enactment, beginning with my Super 8 film performance Paper Landscape of 1975. 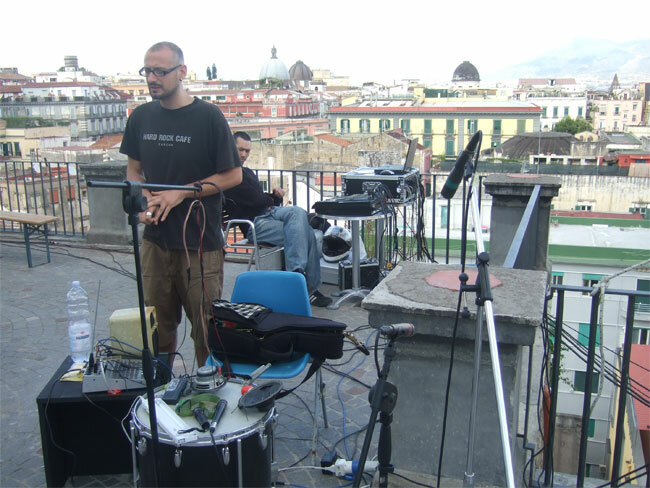 For Lumen’s Evolution Festival in Leeds 2006, curated by William Rose, I based my programme around this idea and invited Alan Wilkinson to play live against a recording I’d stolen of him twenty years earlier, playing scales, that had become the soundtrack for Views from Home. During the performance, which took place in Leeds City Art Gallery, Alan circled the room a few times then stepped out (surely not to look at the paintings?) 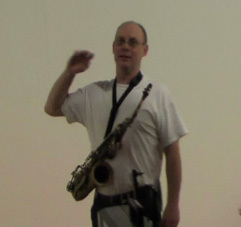 while continuing to play, the sound of his sax muted by the intervening architecture. All in the presence of our mutual hero, filmmaker and musician Michael Snow. A few years previously, in 2002, I was invited by Image Forum Tokyo to perform my films in Fukuoka, as part of their touring festival. I also visited Maya, my daughter from my first marriage, who was teaching English in a nearby village. When Maya was very young I had worked on Messages (1983) a half-hour film partly inspired by her innocent questions about the world. For the performance at Fukuoka City Library Maya stood to one side of the screen and translated the on-screen text (that included her questions as a child) into spoken Japanese, rather like the benshi performers of the silent period who would interpret for the audience the events on the screen. Thank you Maya! Performing while looking after young children can be difficult, and would probably be impossible without Lynn’s careful preparation, clever use of the DVD player, and occasionally a volunteer to look after them. Our first venture was to Windsor Ontario in February 2008 when Kai was just five months, barely old enough to fly. We arrived in the worst snowstorm in memory. Luckily the distance from our accommodation to the venue was only a couple of streets, deep in snow. Media City is a great little festival, thoughtfully curated by Jeremy Rigsby and Oona Mosner. We set up our projectors with Kai nearby in his basket. 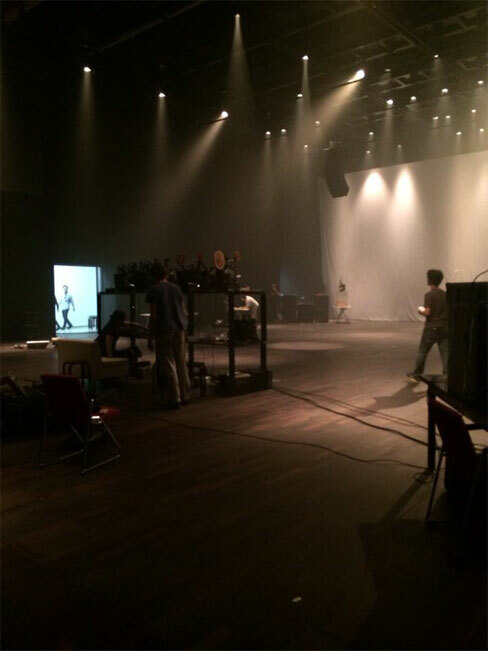 During the show Lynn had to leave the projectors in order to feed him – then immediately return to project. 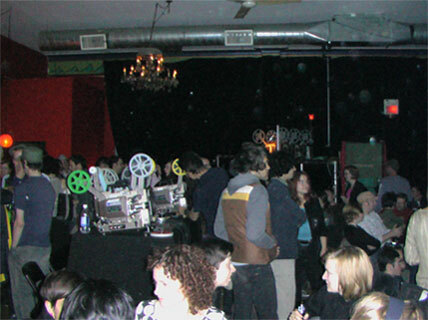 Now that the children are older (currently six and three) and if we’re lucky, the venue will have a room adjacent to the screening space where we can set them up with a DVD while we perform. But that’s not always possible. For a performance event at the new EYE Institute Amsterdam to mark their completion of an archive project for my films (thanks to Simona Monizza and Guy Edmonds) we had to leave the children in a room three floors below, accessed by lift, which added considerably to our performance nerves. These days, for certain venues such as S. Korea, we’ve been able to leave the children with family in Singapore, freeing us to participate fully in the festival – a rare luxury. Along with an increase in outdoor performances, as mentioned earlier, we find ourselves increasingly invited to music/film events (perhaps one explains the other?). 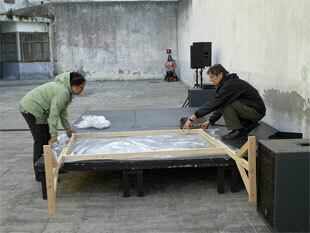 This year Cable/Mire in Nantes, Audiograft in Oxford, Miranghang in Seoul and Latitude Festival in Suffolk. 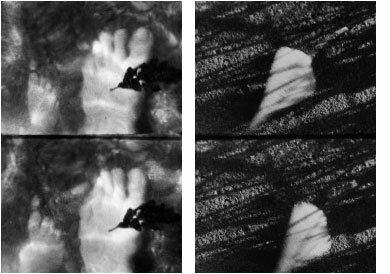 In part this can be traced back to the publication of my book/DVD Optical Sound Films (LUX 2007) but also perhaps to the increasingly similar agenda of film artists and noise/music artists in their use of physical source material combined with analogue and digital processes. 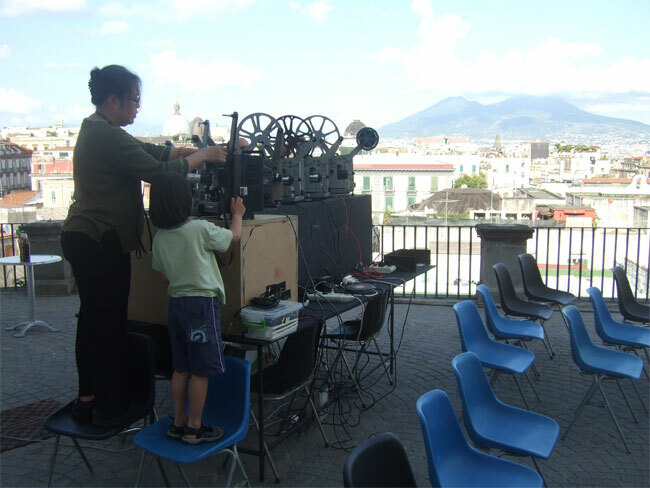 Our work in live cinema attempts to free up 16mm film projection and bring it closer to the flexibility of improvised music, while giving greater importance to the dimension of sound. The Grenoble-based group Metamkine does this with great skill. It feels that we are starting out again, this time as improv performer/musicians, which is both challenging and scary. True improvisation is difficult with film. The nearest I have been to it happened recently and by accident, which is often the best way. While setting up for a performance of Soundtrack Augmented with improv musicians Cranc, at Café Oto Dalston, my looper failed and I had to quickly reconfigure the work, even making radical changes during performance. For me the performance was successful, but that’s the thing about improv, as a performer it’s difficult to judge, isn’t it? 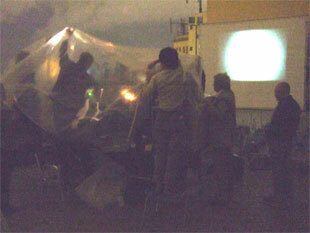 Fixing Eiki projectors and rehearsing for the first performance of Mobius Loops at Star & Shadow, Newcastle 2007. 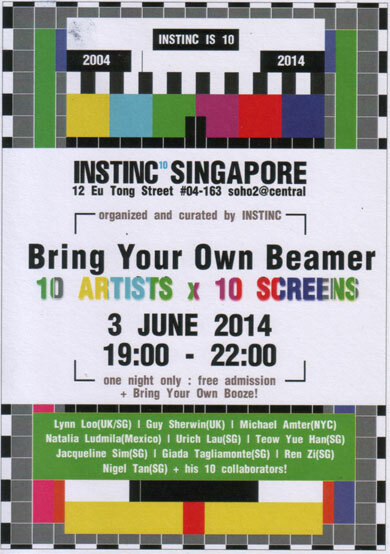 Thanks to all the curators and organisers who have invited us to perform. Much of the above text relies on my memory, not the most accurate of instruments. Apologies for all lapses, errors and augmentations. Guy Sherwin was born in 1948, he lives and works in London. 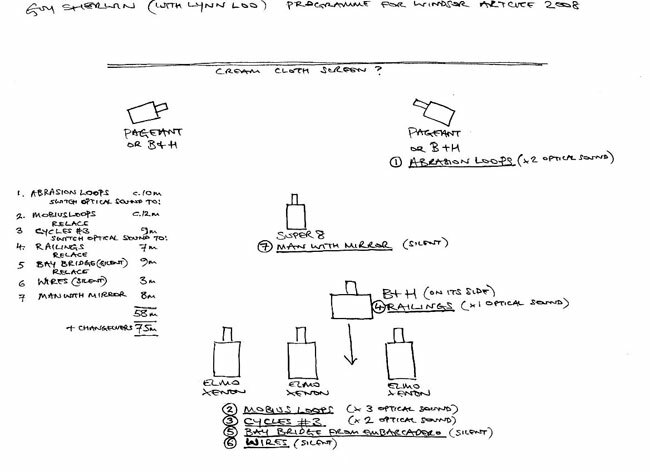 Select exhibitions from include FILM IN SPACE at Camden Arts Centre, London (2013); SHOOT SHOOT SHOOT at Tate Modern (2002); andA CENTURY OF ARTISTS’ FILM & VIDEO at Tate Britain (2003/4). 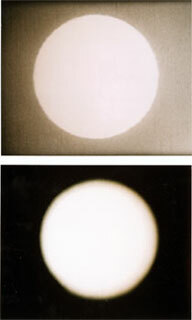 His book and DVD OPTICAL SOUND FILMS 1971-2007 was published by LUX (2007). 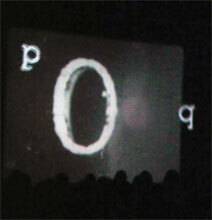 Sherwin’s 16mm film AT THE ACADEMY (1974) is in Tate’s permanent collection.